On Monday, April 25, 2016, the commissioners voted to approve a preliminary budget that was $3.5m short of the school system’s request. Neither was any consideration offered to the school system’s ability to offer year-over-year raises to its employees. In short, the same thing that has happened for the past six years — the school system having to go back and make cuts to its preliminary budget to account for the lack of funding. We know that any more cuts will be painful to our students, teachers, other school system employees and community. 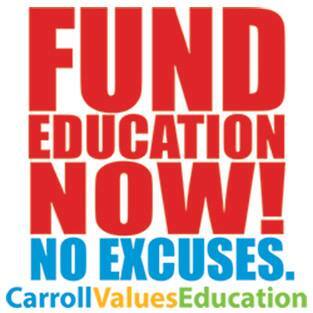 If you prefer to scan and email, send it to us at info @ carrollvalueseducation.com (removing the spaces).